Scientific AmeriKen: Alcohol and Freezing - determining the freezing ability of water as a function of impurity! Just how strong is alcohol at manipulating water's freezing point? Unlocking the answer to this question just may change the world of designer party favor ice cubes - FOREVER...! Water is found almost everywhere and despite its vital importance to every living creature on the planet - many aspects of this substance are poorly understood. The purpose of this experiment will be to study the freezing properties of water as it is mixed with another substance. Although many substances could be used to study the freezing properties of water this experiment will focus on ethanol allowing for the determination of exactly how "potent" ice cubes can get. (-173oF). Given the freezer being used is no colder than -20oC (-4oF) it is the hypothesis of this experiment that very little ethanol will be needed to lower the freezing point of water tremendously and thus even at low percentages of ethanol ice cubes will not be able to form in the freezer. Used in this experiment is laboratory grade ethanol (99% pure) and distilled water. Alcohol was then mixed into varying concentrations and measured out to exactly 10 ml. The 10 ml fractions were then poured onto the ice tray and frozen overnight. Observations were made the next day to determine the freezing ability of each fraction. 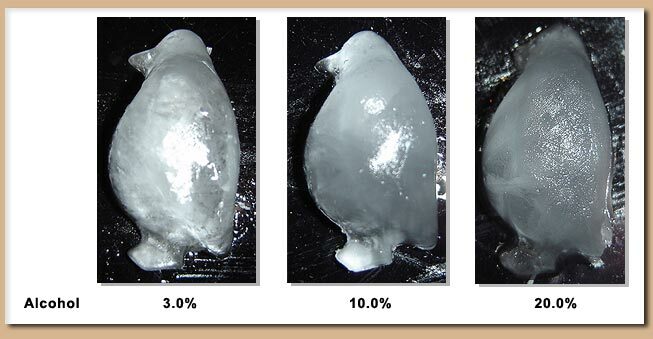 After 24 hours of freezing it appears as though fractions as high as 10% ethanol were frozen solid - Although there is some difference of the appearance of the ice cube above 3% as noticed by a more translucent look (Figure above). At first glimpse the fraction containing 20% ethanol did not appear to be frozen solid however upon further analysis (Figure below) a solid penguin was formed at this level. Judging from the quality of the fraction at 20% and that no ice formed at 50% it seems that at most 25% is the upper limit at this freezer temperature. The data seem to indicate that the creation of very potent ice cubes is possible. It appears that even at 20% ethanol it is possible to form ice cubes - thus beverages such as beer (~5%) and wine (~8-12%) and even some heavier alcohols have the potential to be "cubed". Although it is noted that further research revealed limited survival skills of the 20% ice penguin, who survived just under 2 minutes in a glass of cool water. In sum the data has refuted the hypothesis thus demonstrating that water can maintain near its freezing point despite its impurities - showing the value of this experiment as something more than simply figuring out a nifty party gimmick.